This machine adopts vacuum technology, the early vacuum technology is used in medicine for recovery after scar removal and liposuction surgery, then technological progress, vacuum technology is applied to the deep massage to promote the cell to do aerobic exercise, has extraordinary detoxification and health benefits, has a good effect on improving the orange peel organization, highlighting the “healthy body sculpture”. Radio frequency (RF) refers to the electromagnetic wave which is transmissible and can be launched, hereinafter referred to as RF in English. Endogenous heat causes instant shrinkage to the dermal collagen fibers and stimulates secretion of more new collagen. The energy causes the temperature of the dermal tissue rise, enhances the oxygen flow rate of the body, improve blood and lymph circulation, activates metabolism, eliminate and soften cellular organization. Wavy mechanical roller, except performs as electrodes for release of RF energy, it can also rolling the problematic tissue during the treatment process, it’s very similar to the feeling of traditional way of pushing the fat by hand. It can accelerate the passive movement of the area receiving the treatment, accelerate the body fluid circulation and detoxication. 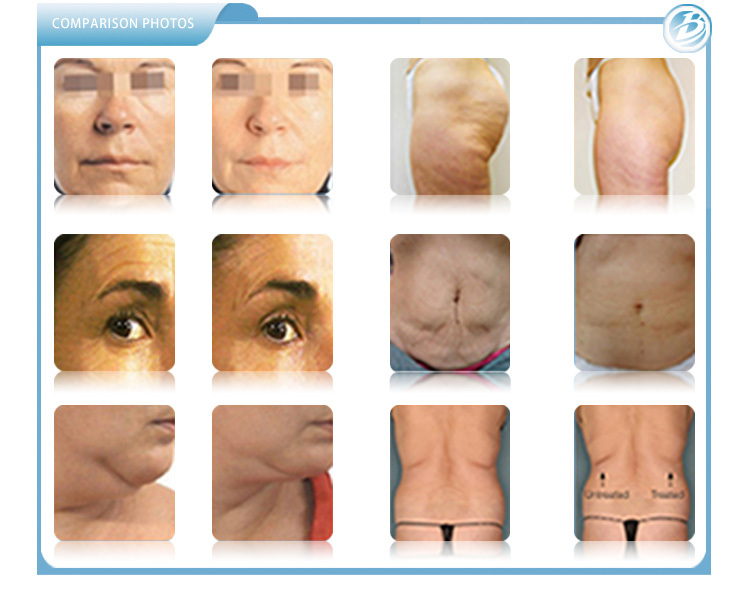 Large cellulite is softened and the decomposition is accelerated by rolling. Besides, the rolling can also help accelerate the repair and improvement of orange peel fat. To use the negative pressure which caused by the mechanical movement, to get the RF penetration depth to 5 ~ 15mm, and use the rollers to pick up and stretch different cortex fibers, to decompose of subcutaneous fat by squeezing capillaries, lymphatic vessels effectively, prompting the human metabolism. 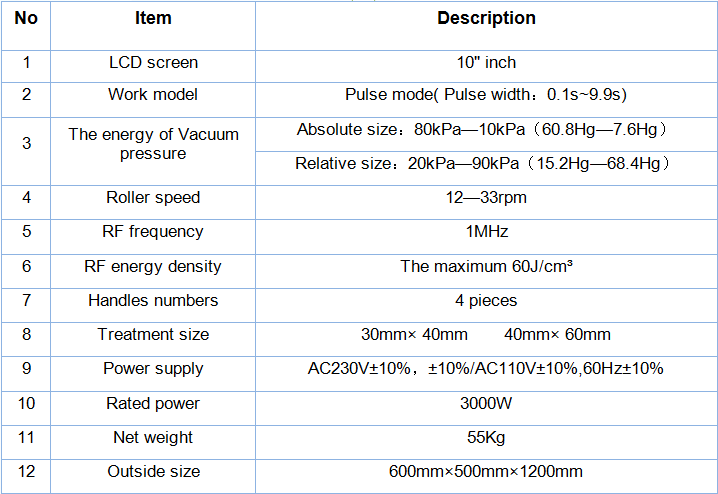 650nm specific wavelength of semiconductor laser can improve the liquidity of fluid between the skin and muscle cells, stimulate movement between cells, activate cells and improve skin elasticity. While at the same time, it accelerates blood circulation of imperceptible blood-vessel, and drainage excess toxins through the lymphatic system, and it can effectively decompose the facial pigment and splash through 905nm light irradiation. The negative pressure suction(maximum 8Kg) can fully adsorb the various layers of the skin tissue to the bipolar radio frequency, and make the radio frequency energy more effective to reach the subcutaneous tissue (the fat layer), and the suction and discharge of the negative pressure promotes the circulation of the blood, improves the new aging of the local tissue, and the suction and discharge of the negative pressure can make the skin and the skin. The muscle tissue is fully relaxed to relieve the fatigue of the skin and muscle tissue, and the comfort of the patients with the simultaneous output of the monopole RF energy and the energy of the infrared light will increase twice as much. ※ Safe: There won’t be any trauma or harm to skin tissues. ※ Long Service Time: Hundreds of thousands of dots are available to be used, so long lifetime is guaranteed. ※ Efficient: Generally the whole body treatment is 45 ~ 60 minutes, topical treatments is 15 minutes, two times a week, 10 times as a course of treatment. ※ Comprehensive: Four sizes of handles so that suitable for all parts of our body.